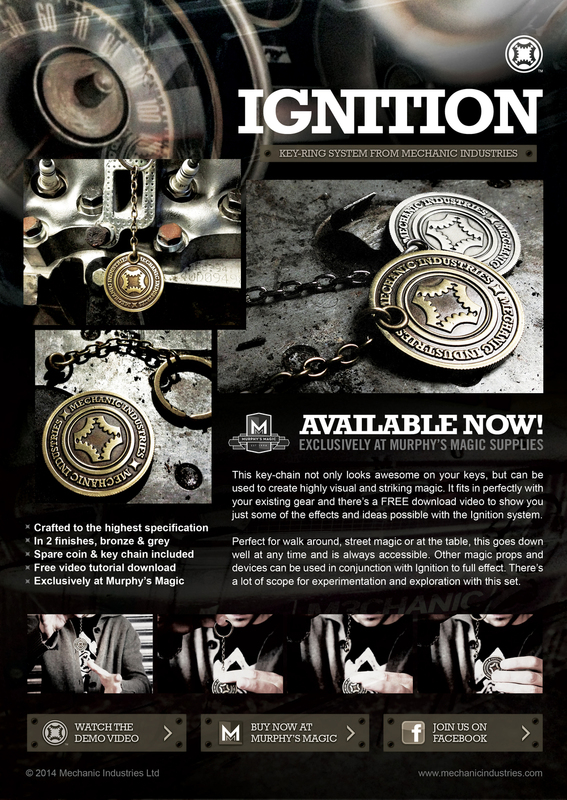 We have just launched our newest addition to the Mechanic Industries Gear - Ignition Key-Rings. Available from all good on-line magic retailers. Dealers please contact Murphy's Magic Supplies. We've had some great reviews and feedback so far and can't wait to see what you guys can come up with. "I like the practicality of this trick because it packs small enough to go anywhere with you. You can even put it on your key chain and use it as a conversation starter that turns into a powerful visual mystery before anyone realizes you’re doing a magic trick to begin with. For walk around, or street magic settings it’s a wonderful addition because it can be visual, it is certainly flexible, it doesn’t take up a lot of pocket space, and the reset is *** near instant. It will require you to be useful with sleight of hand though… oh ***! Guess you can’t be lazy with every magic trick right? Go drag out your mirrors and video camera’s boys, you’ll want to practice this till it’s polished; and the polished effect is a pretty one too!"